Lt. Gen. Michael Hamel officially retires from his posting as the Commander of Space & Missile Systems Center (SMC) on July 1, 2008. We discuss the history and future of SMC as well as the Generals distinguished career. On July 7th of 2007, Gen. Pawlikowski was assigned to the SMC as the Vice Commander. During MilsatMagazines opportunity to speak with the Commander of SMC, Lt. Gen. Hamel, Gen. Pawlikowski also made herself available to our publication to give answer some questions as well as give our readers some insight into her U.S. Air Force career and her opportunities with SMC. PRIORITY BRIEFING - General James Armor (Ret. ), Member, Board of Directors, Integral Systems, Inc.
Now retired from a highly successful career in the airforce, General Armor discusses his former role in the armed forces, and his present position on the board of Integral Systems. Size, weight and power, or SWaP in military parlance, is being reduced both at the terminal level and the individual networking device to more effectively provide COTM capabilities. These trends are compelling satcom vendors to make some bold R&D investments in new and emerging technologies, and develop a new generation of satellite products to meet the requirements of the modern mobile warfighter. The Space and Missile Systems Center traces its ancestry back to the Western Development Division (WDD) of the Air Research and Development Command (ARDC). WDD was activated on July 1, 1954 and was redesignated the Air Force Ballistic Missile Division (AFBMD) on June 1, 1957. The United States has come a long way since President Ronald Reagan first delivered his challenge to the defense community 25 years agoto develop antiballistic missile technologies to improve our national security and lessen our reliance on nuclear deterrence. The Transformational Satellite Communications System (TSAT)a system that is being designed to introduce technologies that will address warfighter needs 10-15 years from nowimplemented a back-to-basics approach and successfully matured key technologies to a level that will ensure success on this vital satellite system. Gregory L. Smolka is responsible for growing Vectrons strong market positions in test and measurement, medical imaging, process control and other industrial applications while reinforcing the companys leadership position in defense and space markets. 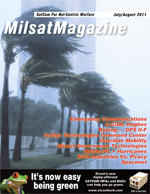 MilsatMagazine information, staff and edition notes.